There are many creative ways to display trophy buckles other than wearing them. Once, several years ago, I was visiting the home of Bill Horn; National Reining Horse Association’s first “Million Dollar Earner”. He and his wife Kim (also a top NRHA competitor) had an impressive trophy buckle collection. Kim Horn had creatively designed an elegant glass-topped coffee table for their living room that doubled as a display case. This was a tasteful and stylish solution for the veteran competitor with several buckles to display. On the other hand, recently I ran across a wonderful way to display just one very special buckle. 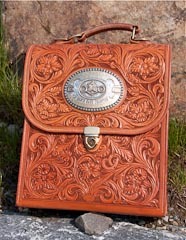 The owner had a lovely custom case made with the buckle mounted to it. For horsemen who aren’t as comfortable wearing their trophy buckles or who have a buckle they would like to use but still keep looking nice, this is a terrific solution. 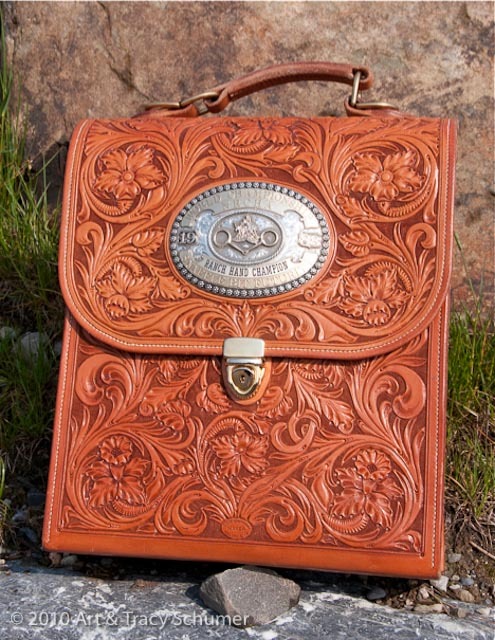 This handsome, fully flower tooled “gentleman’s case” was custom made by saddle maker Steve Sherrill, of Hillsville, Virginia. For us gals, this idea would certainly work well incorporated into a custom ladies’ handbag.